Thyristorised D.C Welder Quantum is a combination of high quality performance, site worthy construction and sleek good looks. 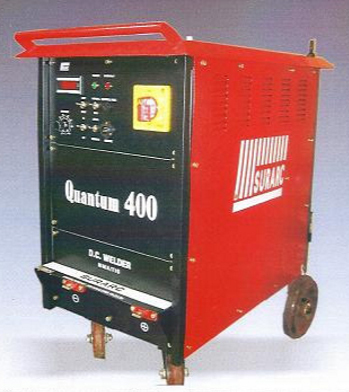 Apart from a D.C Manual welder, Quantum is an excellent machine for D.C TIG Welding with suitable accessories. Ideal constant current power source for manual MMA/TIG Welding. Excellent arc striking upto 100 meters cable length (Electrode cable+ Ground cable). Cable length drop compensated. Smooth, Stable arc for consistent X-Ray quality welding. Compact, lightweight power source for easy maneuverability incorporating latest international design and production technique. Advanced quick response protective circuits. Ideal for rough site conditions. Can be operated from Captive Alternator Sets. In view of continuous development, Sur Iron reserves the right to modify / after the design and/or specification without any prior notice.